The rough-haired golden mole weighs 108 - 142 g (3.9 - 5.1 oz). The rough-haired golden mole occurs in sandy soils in grasslands, meadows and along the edges of marshes. It has also been recorded from gardens and parklands. Golden moles eat invertebrates such as insects, earthworms and snails. The rough-haired golden mole sometimes feeds above ground, and, when it does, it roots about like a pig in search of worms and insects. The rough-haired and giant golden moles live in chambers and passages in mounds reached by a system of tunnels made in part by the golden moles and in part by mole-rats. The rough-haired golden mole is found in Eastern Cape Province, KwaZulu-Natal, Gauteng and South Mpumalanga, South Africa. While its area of occurrence may appear large, the rough-haired golden mole is only known to occur in 10 isolated areas. Only three specimens were collected in the period 1980 - 2003. There are no data that would allow the determination of its population size. Major threats include habitat alteration as a result of mining shallow coal deposits for power generation, ecologically-poor agricultural practices, and urbanization. *** It is called the "rough-haired" golden mole because it and the other species in its genus, the giant golden mole, have fur that is harsher in texture than that of the other golden moles. *** The rough-haired golden mole has a remarkable sense of direction in regard to the exact location of its burrow; when threatened, it dashes rapidly and surely for the entrance (Nowak 1999). *** The rough-haired and other golden moles have been blamed for damage to crops that was actually caused by rodents, such as mole-rats. The rough-haired golden mole weighs 108 - 142 g (3.9 - 5.1 oz). The rough-haired golden mole is found in the Maputaland-Pondoland-Albany Biodiversity Hotspot (Cons. Intl. 2005). The rough-haired golden mole sometimes feeds above ground, and, when it does, it roots about like a pig in search of worms and insects. It walks at night to foraging sites that are recognizable by the disturbed soil where these golden moles have rooted for insects with their horny nose pads (Ledger 1999) . 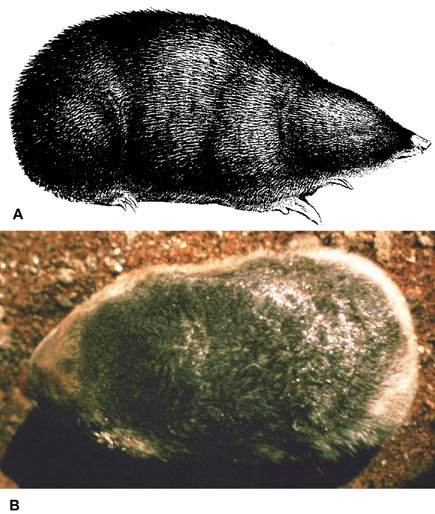 The rough-haired and giant golden moles live in chambers and passages in mounds reached by a system of tunnels made in part by the golden moles and in part by mole-rats (Nowak 1999) .